Known Hazards When grown on nitrogen rich soils (and particularly when these are cultivated inorganically), the plant tends to concentrate high levels of nitrates in its leaves. The leaves are perfectly wholesome at all other times. Avoid with gallstones. Habitats Waste ground, field verges and roadsides, avoiding acid soils[7, 9, 17]. Range Most of Europe, including Britain. Bloom Color: Pink. Main Bloom Time: Early summer, Early fall, Late summer, Mid summer. Form: Upright or erect. Malva sylvestris is a BIENNIAL/PERENNIAL growing to 0.5 m (1ft 8in) at a fast rate. It is hardy to zone (UK) 5 and is not frost tender. It is in flower from June to September, and the seeds ripen from July to October. The species is hermaphrodite (has both male and female organs) and is pollinated by Bees. The plant is self-fertile. Leaves - raw or cooked[2, 4, 7, 9, 94, 183]. Mucilaginous with a mild pleasant flavour, they are nice in soups where they act as a thickener. The young leaves also make a very acceptable substitute for lettuce in a salad[K]. Immature seed - raw. Used as a nibble, the seeds have a nice nutty flavour but are too fiddly for most people to want to gather in quantity[K]. Flowers - raw. Added to salads or used as a garnish. A pleasant mild flavour, with a similar texture to the leaves, they make a pleasant and pretty addition to the salad bowl[K]. The leaves are a tea substitute[46, 183]. Antiphlogistic; Astringent; Demulcent; Diuretic; Emollient; Expectorant; Laxative; Salve. All parts of the plant are antiphlogistic, astringent, demulcent, diuretic, emollient, expectorant, laxative, salve[4, 7, 9, 21, 46, 222, 238]. The leaves and flowers can be eaten as part of the diet, or a tea can be made from the leaves, flowers or roots. The leaves and flowers are the main part used, their demulcent properties making them valuable as a poultice for bruise, inflammations, insect bites etc, or they can be taken internally in the treatment of respiratory system diseases and problems with the digestive tract[4, 238, 254]. When combined with eucalyptus it makes a god remedy for coughs and other chest ailments. Mallow has similar properties, but is considered to be inferior to the marsh mallow (Althaea officinalis) and are seldom used internally. The plant is an excellent laxative for young children. The leaves can be used fresh whenever they are available or can be harvested in the spring and dried for later use. The flowers are harvested in the summer and can be dried for later use. The German Commission E Monographs, a therapeutic guide to herbal medicine, approve Malva sylvestris for cough, bronchitis, inflammation of the mouth and pharynx (see  for critics of commission E). Cream, yellow and green dyes can be obtained from the plant and the seed heads. A tincture of the flowers forms a very delicate test for alkalis[4, 115]. The leaves are used to relieve insect bites and stings. A fibre obtained from the stems is useful for cordage, textiles and paper making. Landscape Uses:Border, Massing. A very easily grown plant, succeeding in ordinary garden soil and in poor soils. It prefers a reasonably well-drained and moderately fertile soil in a sunny position, where it will produce a better crop of salad leaves[K]. Plants are hardy to about -20°c. There are some named forms, selected for their ornamental value. 'Mauritiana' is larger than the type with much more ornamental flowers. The flavour of the leaves and flowers is considered by many to be superior to the type species. Plants seem to be immune to the predations of rabbits. Prone to infestation by rust fungus. Special Features: Not North American native, Naturalizing, Attractive flowers or blooms. Please tell me were in canada can i buy malva sylvestris. 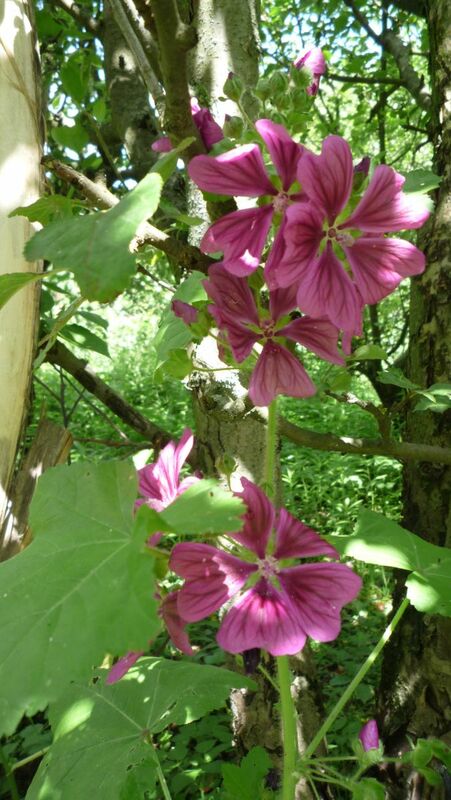 Is Malva sylvestris Zebrina edible - it says poisonous on the seed website! I can find no reference to this being toxic, Bown,( Ref 238 above) who never seems to be wrong about anything, specifically mentions this variant as edible and medicinal. But excess can be laxative and see the note above on toxicity if grown on nitrate rich soil. Some Malva species are toxic however, I suggest you contact the source that said it is toxic and ask for a reference or if they are sure. it is a fantastic remedy for infected wounds. My mother would steep leaves in water. and apply the cooled down leaves directly over wound. Put a bandage on top. a few hours later remove bandage and leaves, with it the infected part will come off.